The CSS Wilmington was the last of three ironclad warships built by the Confederate navy in Wilmington during the Civil War. Work began on the CSS Raleigh and CSS North Carolina in the spring of 1862, but neither vessel proved satisfactory. The Raleigh ran aground in Cape Fear in May 1864 and was written off. The North Carolina leaked badly and in September 1864 sank at its moorings. In late May 1864 the Confederate secretary of the navy, Stephen R. Mallory, dispatched naval shipbuilder John L. Porter to Wilmington to build a new ironclad. Construction on the Wilmington began immediately. Most of the timber came from South Carolina, and iron plating, salvaged from the Raleigh and North Carolina, was readily available in Wilmington. Although the work progressed quickly, the ship was unfinished when Fort Fisher fell on 15 Jan. 1865. 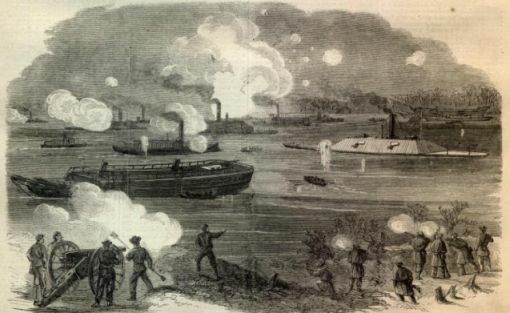 When Union forces occupied Wilmington on 22 February, the Wilmington-nearly completed-went up in flames as retreating Confederates destroyed the navy yard to prevent its capture. "The Rebel Iron-Clad Fleet Forcing the obstructions in James River.–[Sketched by A. R. Waud.] Harper's Weekly, February 11, 1865. Available from Son of the South: www.sonofthesouth.net/leefoundation/civil-war/1865/confederate-ironclads.htm (accessed May 16, 2012).